Are we at war with radical Islam or not? Government actions leave the answer much in doubt. 1. Do not eat, drink, chew or smoke anything outside (even while riding in a car). 2. FEMALES ONLY: Do not show any part of your arms, legs, abdomen. Wear long pants and long sleeves at all times. 3. The swimming pool is basically off limits to FEMALES (unless you want to swim in long pants and long sleeves). **These guidelines DO NOT apply on CAMP PATRIOT. They DO APPLY at the washracks. 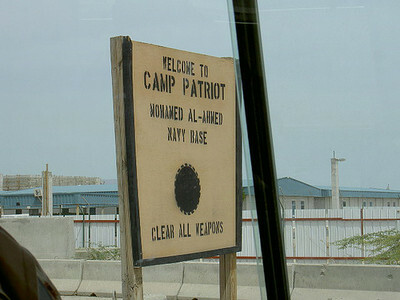 I realize this may cause some problems for us, but the camp cell is asking for our cooperation with the host nation. The host nation does have the ability to fine persons in violation. If you have any questions, please direct them to MACM McKendrick and he will address your concerns with the Command Seargent Major, if necessary. Both the indoor and outdoor swimming pools are in sight of Kuwait military offices on the second floor. They have recently been offended by some horseplay that took place between a male and a female in the pool. A male soldier was dunking a female soldier, and the Kuwaitis deemed that to be inappropriate and sexual in nature. They also expressed serious concern over the attire of the female. Although she was wearing shorts and a shirt over her bathing suit, the shorts were white and "see thru" when wet. They did not fine anyone, but they did threaten loss of pool privileges. Just remember, they are very conservative in many aspects. What is normal activity for us in the States is not normal for them.